An improvised happening by Grand Gestures Dance Collective at Newcastle Central Station. Passing deliberately seeks to present pedestrian, or everyday, movement, as dance. The dance language here is not the technical language of a recognisable dance-form, but the language of everyday being in the body. The dance is made from simple movements like walking, looking, stillness, sliding a foot, standing in a queue. Out of these everyday movements emerge patterns, repetitions and spatial groupings. The participants are clearly ordinary people with ordinary bodies: this dance is not about a construction of a perfected or virtuosic body, but a profiling and a celebration of the everyday lived-in body and its movements. Passing, like all of my work, seeks to make known the deeply pleasurable sense of human connection experienced in simple acts like this. The nature of the activity perhaps reinforces and forges social bonds through a sense of connected physicality. 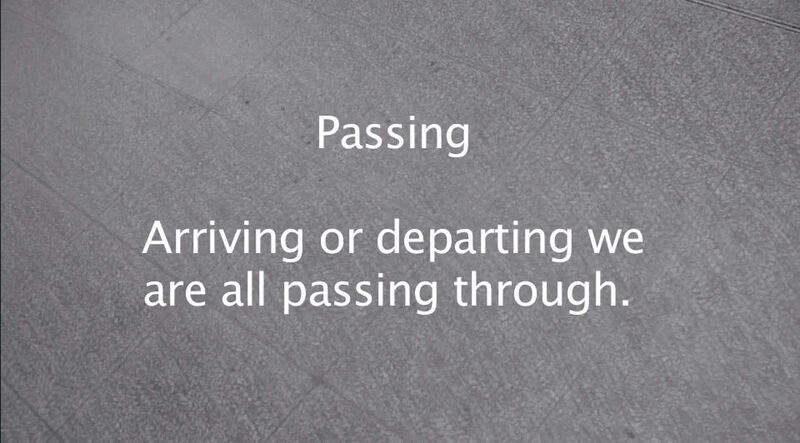 The title of the piece Passing and its location in a train station play with the idea of transience: we are all passing through, all of us journeying, all of us travellers in time and space.